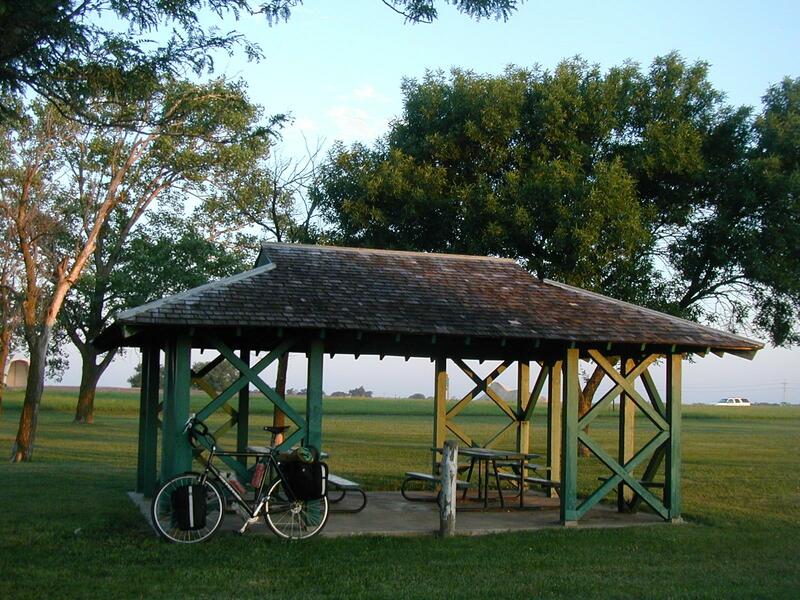 This page documents a bicycle trip from Fort Collins to Wichita during the week of 4th of July 2003. 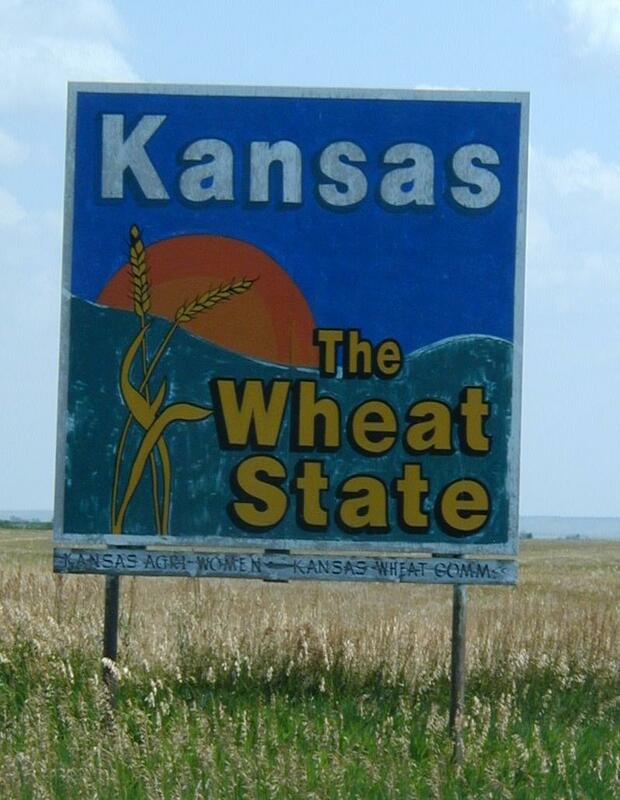 Highlights of the trip included the numerous small Kansas towns and getting a general feel of the Great Plains as I crossed from the Rocky Mountains eastwards to smaller farms in Kansas. This area was one of the last to be settled in lower 48 states. 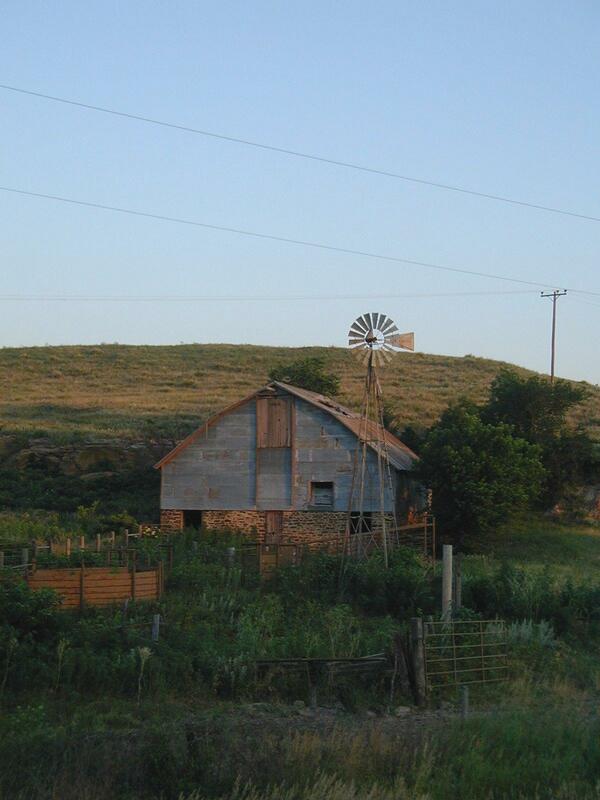 It took new innovations such as windmills for water or barbed wire for fences to open this area up to productive agriculture and settlement. In successive times prior to that, the land supported nomadic indian tribes and also the cattle drives. This way I'd piece together a third trip across the US and also eventually bicycle the six US states I'm missing. 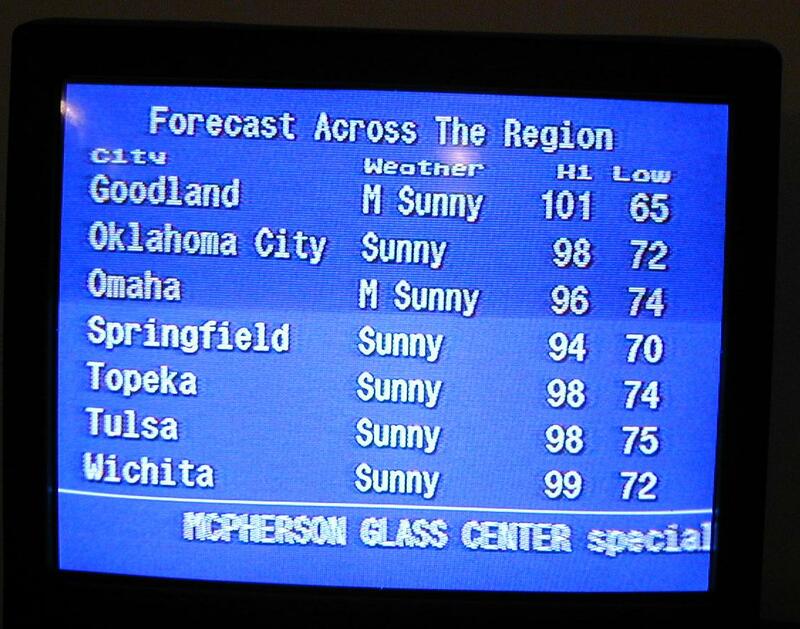 I had originally planned this trip to continue on to Tulsa, but as you'll read below in the trip logs, found that the high temperatures and prevailing southerly breezes convinced me that Wichita would be a better destination. The map below shows my general route. On the road again for a tour through the great plains. The idea for this trip is to start from home and ride the next segment of a third cross-USA ride. Along the way I hope to add at least Oklahoma to the list of states I've bicycled. The mileage will be a bit more than normal, so will have to see how things go. Hope for not too much wind from the south. I packed my bike last night and rode to work for a day of work. At 4:45 I dropped my keys in my pannier and declared a start of vacation. I continued eastbound along familiar county roads to 85 and then south to Greeley. Felt a lot like a weekend ride though my bike was heavier. 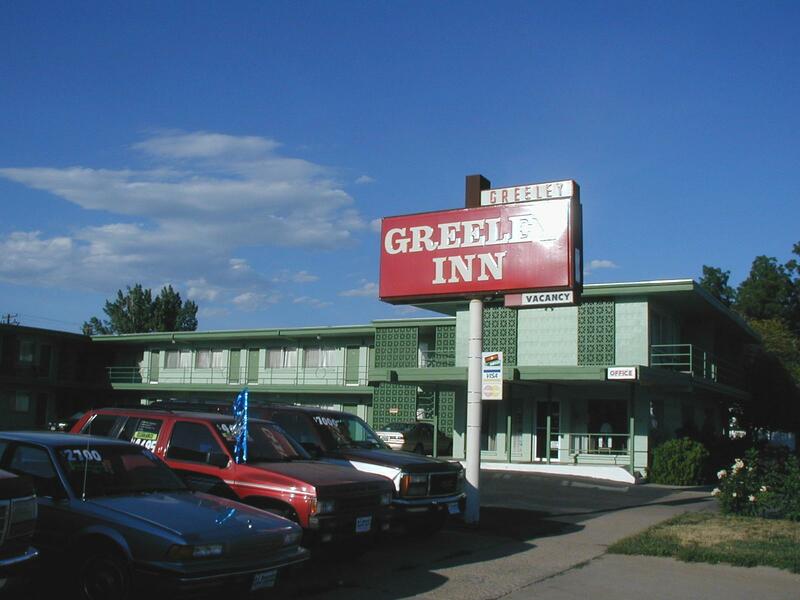 Greeley was holding its Stampede fair, but I had a reservation at Greeley Inn. Only 28 miles, but nice to feel like I was already on the road. A long ride today, both in distance and time. The wind mostly cooperated with a light south wind through the day. The few times I headed south, it was noticeable but otherwise not bad. I was on the road at 5:15am in early morning cool. One mile to a 7-11 for some breakfast items and then I was rolling down the road. Business 34 crossed the South Platte and joined US 34. Nice wide shoulders but unfortunately wide rumble strips so I was frequently back in travel lanes. At mile 8, Kersey has a "town-wide garage sale" but I was too early to see much activity. 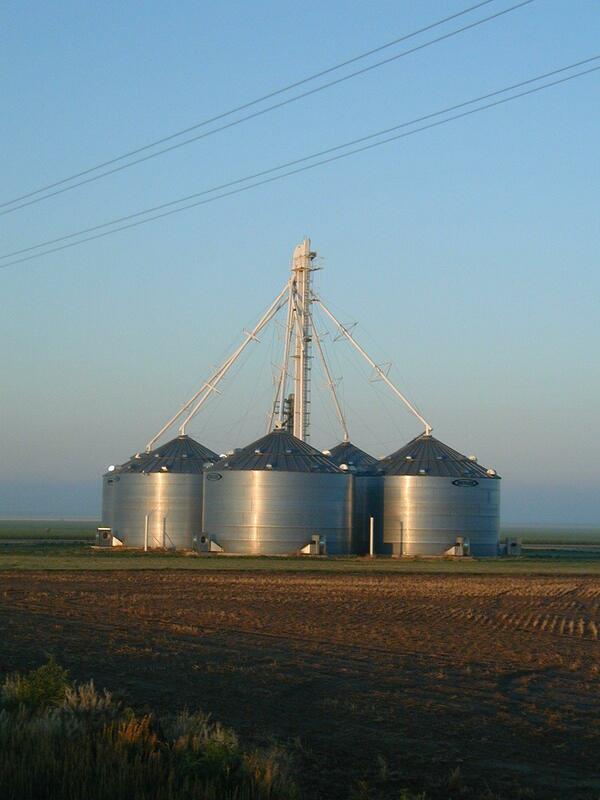 Several feed lots and a mixture of pasture and dryland crops. A moderate amount of traffic in early morning would lead me to believe this could be busy during peak times. All rolled fairly quickly and I was soon at I-76 at 37 miles. A helpful resident directed me to the frontage road. 9 miles along the interstate and 5 miles of US 34 and I was in middle of Fort Morgan. This clearly felt like a regional center. I found my way to McDonalds for 2nd breakfast. From Fort Morgan, back into flat farmland and 10 miles later into smaller town of Brush. Much of this route paralleled a railroad and I saw several coal trains. One was stopped at crossing for 10 minutes, so I struck up conversation with occupants of the first car. They had "265 air conditioning", meaning 2 windows and 65 mph. He had retired from railroad on disability and explained these trains were from Wyoming coal fields. The train cleared the crossing and they drove off heading Minnesota and I to Oklahoma. Of course they had a day and a half of travel and I had a week. After Brush, narrower shoulders and some gentle hills. Also started getting warmer and a cross wind. My speed dropped and I paused occasionally to get feet down stop. At 83 miles I entered Akron in time for late lunch. I entered supermarket to purchase some items and also inquire if a cafe was nearby. Several people all answered and pointed me to cafe in the market. Akron had long main street, two motels a few other stores. Seemed active on Saturday afternoon. From Akron back past dryland farms with an occasional center pivot as the miles added up. The road was in reasonable condition and shoulder wider. I was feeling like I'd had full day of riding when I entered Yuma at 110 miles just before 4pm. Two motels and the second looked inviting. However, decided I'd like to try for a few more miles and rolled past the motel and out of town. Beautiful road the first half of the way to Wray and ugly cracks after that. A thunderstorm was chasing me and I could hear occasional thunder roar. It didn't look too ominous and only a drop or two of rain so I had motivation to continue. As I neared Wray, the road went down into a valley which I followed in town. Found the first motel and didn't quibble when only a smoking room was available. Overall, a nice long ride of 13 hours (including stops) and 137 miles today. Last night the weather channel looked much more scary than my window outside. Multiple storm cells tracking through the plains, including one with 60 mile winds and golf ball sized hail in my county. In the morning the parking lot had puddles and it was lightly raining, but otherwise looked ok. Weather during the day cooperated with only occasional light headwinds. I stopped at nearby 7-11 for breakfast items and then followed US 34 through town and downstream past Laird. At 10 miles I came to the Nebraska border. Yeah! A few miles further the Arickaree River with a deer stopping for a drink. The lowest point in Colorado is where this river enters Kansas and I was now downstream. Around the bend was Haigler and a turn southbound on 27. Immediately started climbing and in a mile came to the Kansas border. Change to central daylight time. Who says Kansas is flat! Some longer climbs and also quick ups and downs crossing drainages. Some cattle and also some ripe wheat fields. The rain stopped and started a few times. It was a fun ride through backroads. No shoulder but still light traffic. 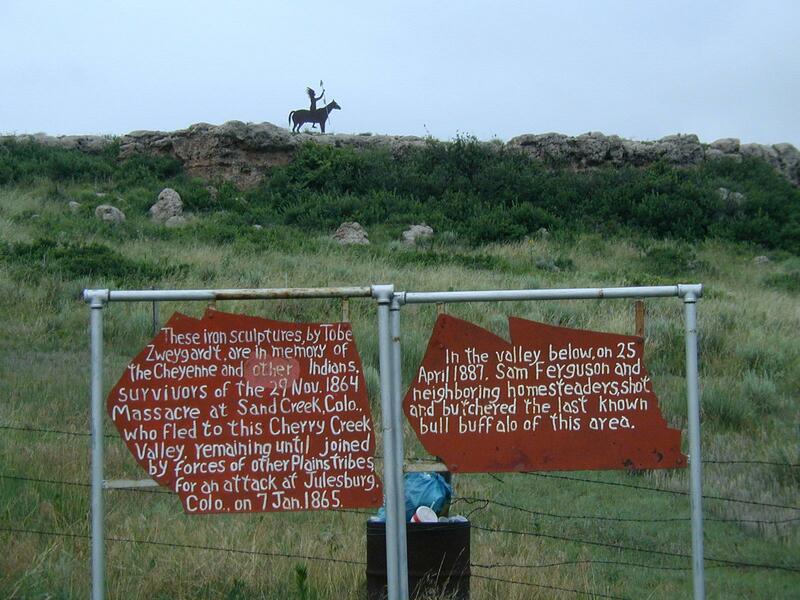 In one drainage was memorial to where indians retreated after the Sand Creek massacre. A few last hills and I was at US 36. A climb up the hill to St Francis. Here I had breakfast at restaurant with very slow service. On leaving the restaurant, asked someone if there were hills on road to Atwood. They chuckled, oh yeah! A long gradual climb and light headwind. Beautiful golden wheat fields along the way. At 56 miles was Bird City with small cafe and lunch. From here mostly level to McDonald and then nice two mile descent and climb. At 78 miles my rear tire went flat. The tire had started to tear along the sidewall. Fortunately I had spare (folding) tire. I thought I had two spare tubes, but one was schraeder, so after relacing things, I'm without spare tube until I pass a bike shop. I had actually felt the tire wobble in the morning on descent coasting hills, just didn't know what was wrong. Five more miles and I was at Atwood. Nice little town surrounded by hills. I took a longer break at a mart. Apparently, they had 2.5 inches of rain last night. From Atwood to Colby was 29 miles south with light wind and many rolling hills. It was slow going, with frequent excuses to pause along wheat fields. Several oversized loads as combines were being moved. 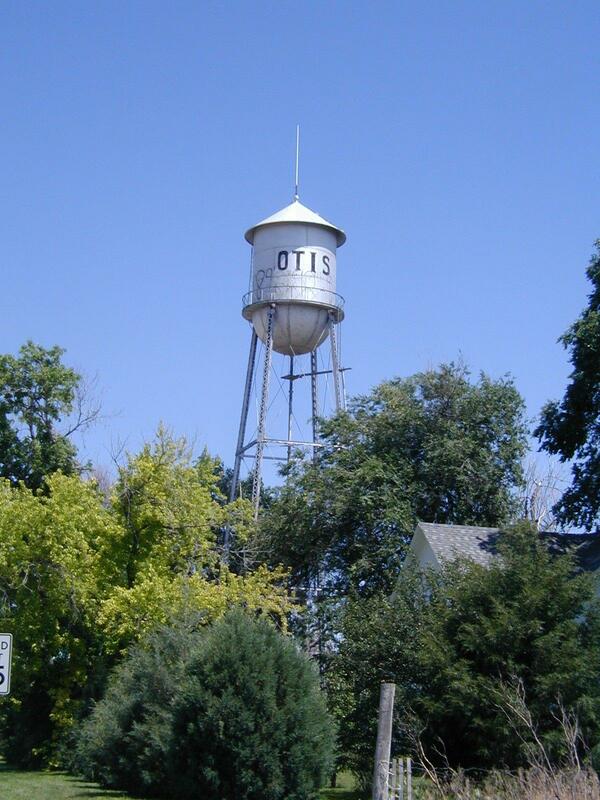 A long slow ride, but soon saw water towers on outskirts of Colby. Colby left a bad impression. The highway KS 25 had long detour. I took a road to city center that dumped me on bumpy brick road. The main street was also narrowed with cones. A SUV gave loud honk when I didn't go quick enough for them. Sheriff sped past only to stop and pick up cones. Eventually, I figured way to 25 South and found motels 2 miles south at I-70. 114 miles today. Today was mostly flat, with almost no wind in the morning. Should have been an easy day? Well, two factors made things tougher: 10-15 mph headwinds in the afternoon and 50-60 miles of gravel. 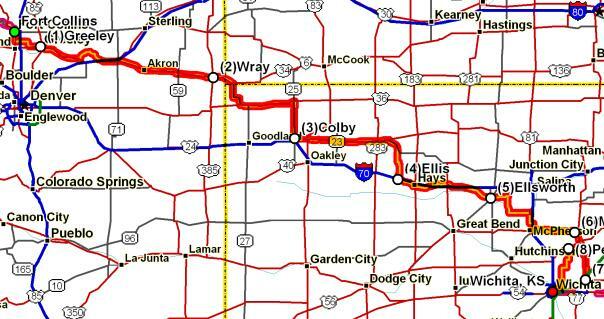 Last night when I picked my route, I thought of either US 24 to Hill City and then to Plainville...or try to follow "old 40" that paralleled I-70. My maps disagreed how much was paved, but I expected ~20 miles of gravel, not too bad. Beautiful clear and calm skies at 6am starting out. Some gentle rolling hills as I passed along golden wheat fields. I could feel previous days of riding but all still went fairly quickly. Saw a few rabbits and also some oil wells. At 20 miles a turn east and followed US 40 to Oakley. 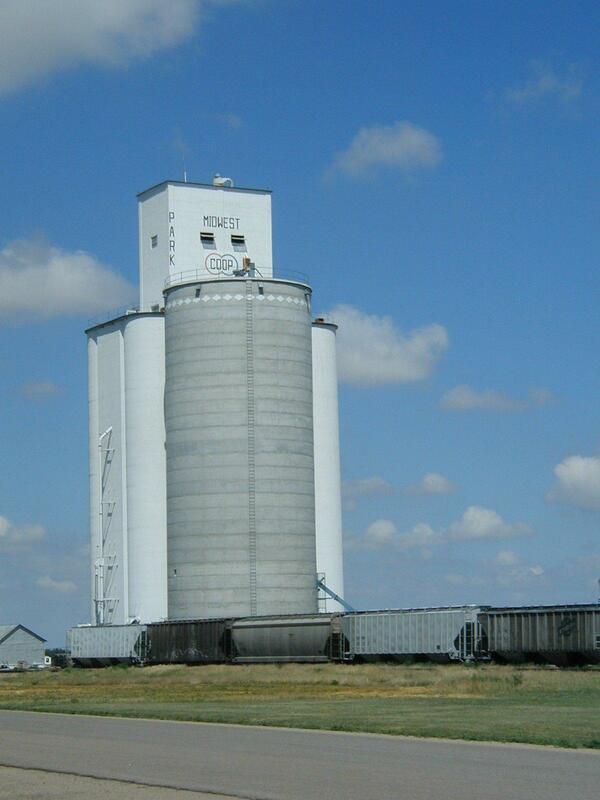 Each of these towns has a large grain elevator, usually just barely visible from the previous town. 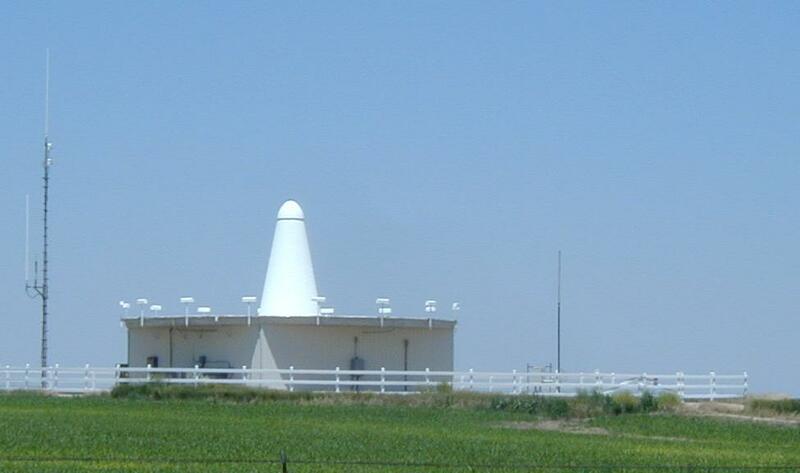 Larger towns also have a water tower. By Oakley, at 31 miles, I was getting hungry so stopped at the truck stop. Eyes bigger than my stomach, so couldn't finish it all. I crossed under I-70 to first stretch of "old 40" I expected to be paved. Turned to gravel in half a mile. 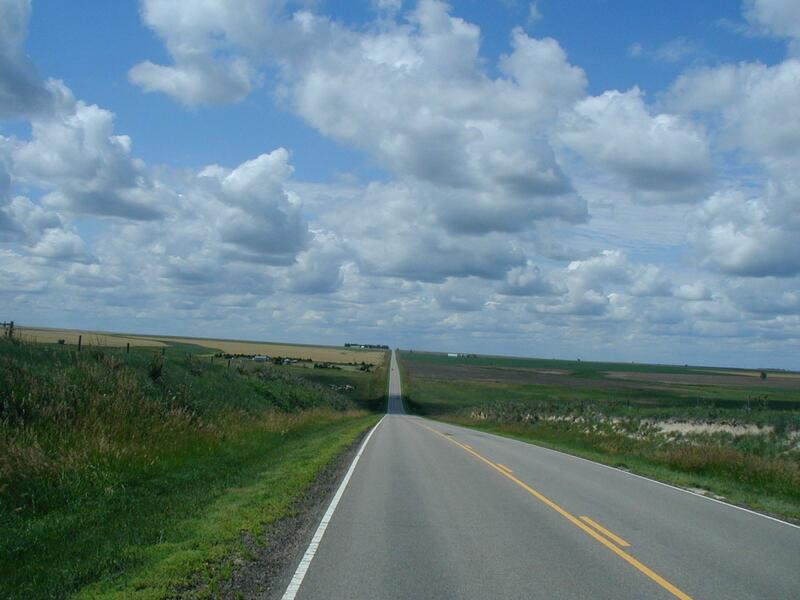 Apparently, it had been paved before but both Gove and Trego counties had torn up the asphalt and converted back to gravel about 10 years ago. Trego County in particular had done a poor job, but I'm getting ahead of myself. First eight miles of gravel wasn't too bad to next grain elevator and Grinnell. Here another 8 miles of gravel to Grainfield. In this first distance, a surprising amount of truck traffic, kicking up dust. Fortunately, winds from south so blew away. On the left half a mile away was railroad and on right also half a mile was I-70. After Grainfield, temperatures became warmer and wind started to shift to headwind. I continued to Park another 4 miles where my toe strap broke. Not too urgent and in Quinter 8 miles further I got a shoelace as temporary toe strap. Each of these places a quick bite and a drink. The road to Collyer was much more up wind and crossing the county line the road also became worse. Soft sandy patches with almost no grading. The next 12 miles to WaKeeney were surprisingly slow. At Wakeeney at 84 miles, I found McDonalds at the exit and cooled down for while. 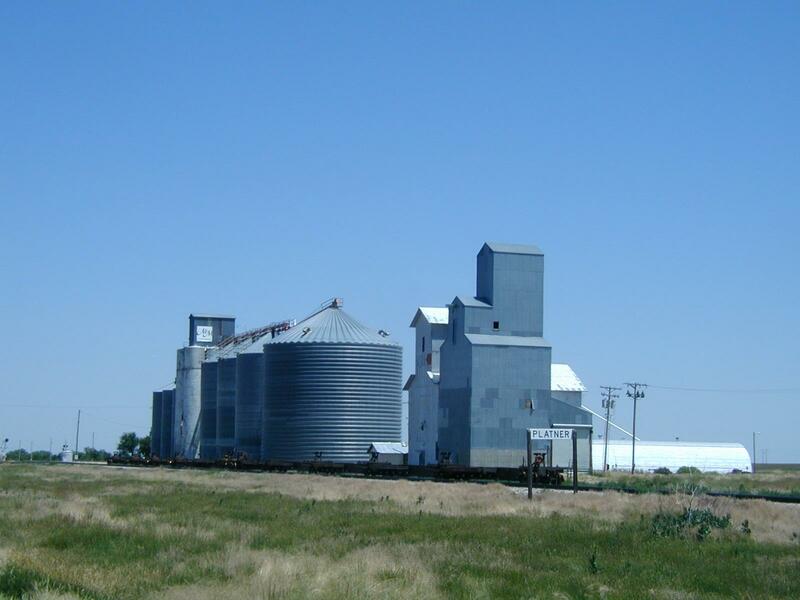 Felt like staying in nearby motels but decided I would get the last of Trego County and gravel road. A slow ride against the wind with occasional trucks passing raising a dust storm. A brief bit of gravel and then happy to see pavement at 99 miles. Yeah! 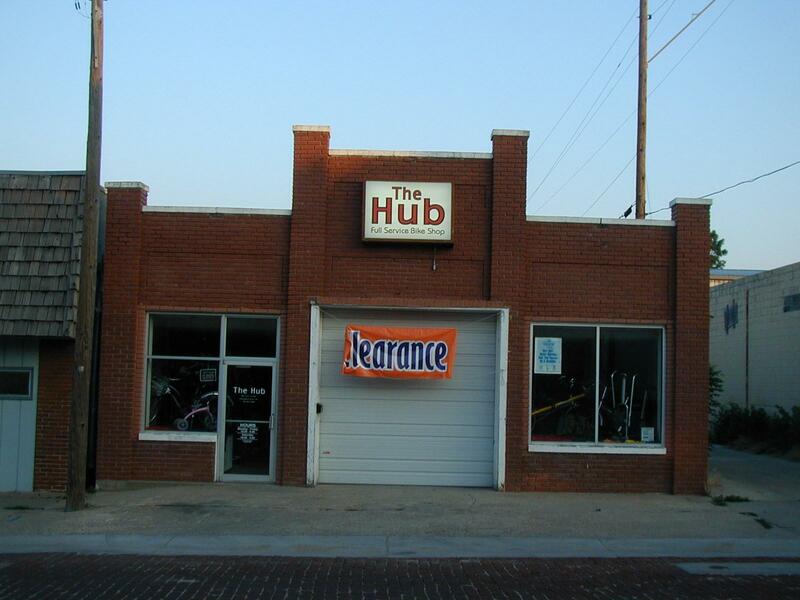 Downtown Ellis has brick streets and few old store fronts. Went north to I-70 exit and found motel at end of a surprisingly long day. 102 miles today. Tomorrow expect a shorter ride as I'll first try to find bike shop in Hays. Weather forecast is more light winds from SE, so will see what that brings. Today a shorter ride with stop in Hays. I followed old 40 all day and the counties had wisdom to keep it paved all the way. Multiple small Kansas towns. I get the sense they are stable in population, not rapidly growing but also not with many old boarded up buildings. Some towns such as Dorrance have quite elaborate parks with well mowed greens. Left Ellis before sunrise and had beautiful ride in cool morning air without wind. The road went back through pastures and farms and slowly busier onto 8th street into downtown Hayes. I found the bike shop by 6:45am at 15 miles. It opened at 10am. Cycled out Main street to main commerical strip, Vine street and found breakfast and a newspaper. Relaxed, read and looked around town a bit. Also found the library to check weather (south winds again), a car rental in NW Arkansas and motels ahead. By 9:45 I was eagerly awaiting owner of the bike shop to open up. At 10:07 they opened. Didn't have 700x35 tubes so I ended up with 700x32, a little thinner but should be ok. Also bought a new tire and threw away the old one. This should have me rolling with a bit more confidence. At 10:15 left Hayes. Unfortunately already becoming warm and the wind was picking up from SSE again. I found old 40 and slowly made way out of town with stops in Victoria and Gorham. I was surprised at how much water I could keep drinking. 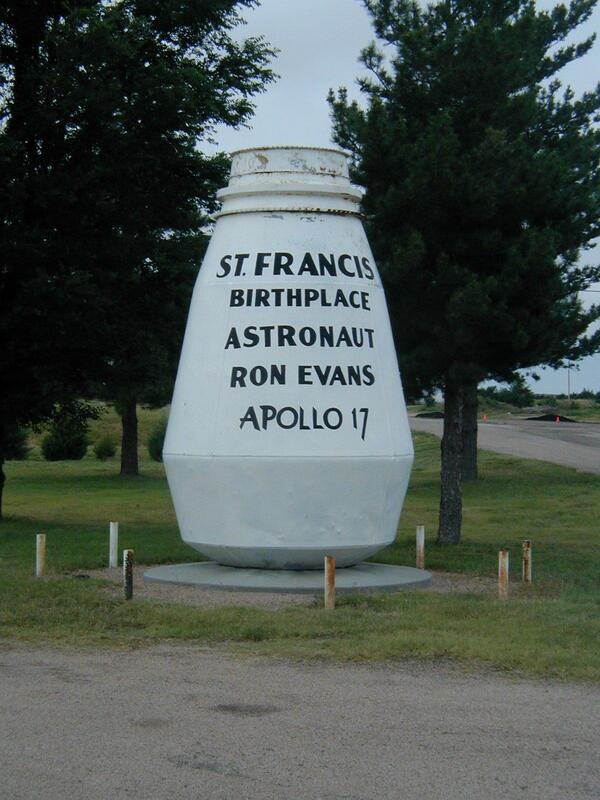 Many of these towns have signs indicating famous people who once lived there. For example, the Walter P Chrysler boyhood home in Ellis, or the 1968 and 1969 wheat queens in Oakley or a rodeo rider named "spuds" in Gorham. With that backdrop, I fully expected large "Robert Dole" signs on entry to Russell. I was disappointed with narry a sign. Only a larger industrial looking area and then main road. Perhaps along the interstate? Russell at 45 miles was chance for later lunch. After Russell, old 40 became frontage road right along I-70 for 9 miles. Also the railroad left, so some gentle rolling hills. At 61 miles was Dorrance with nice manicured lawns. 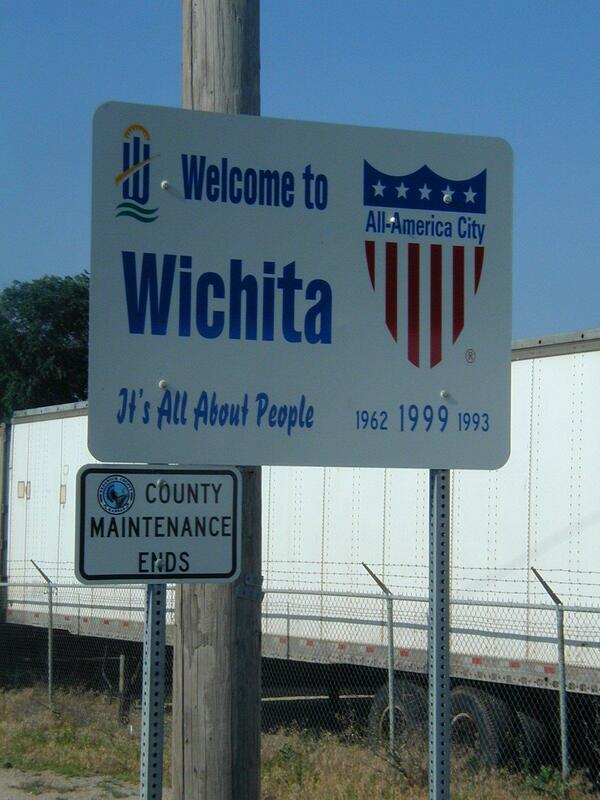 At 69 miles came Wilson, the Czech capital of Kansas. A few painted windows at cafes, but the center of town seemed to be the convience mart with foods, video rental and booths to sit. I stopped for bit to relax and drink more liquid. Last 14 miles had more rolling hills. Worse than this, the wind had picked up and the road went SE more into the wind. It was slow at end of the day, but came past the Ellsworth prison up the last hill and stop for the day. 83 miles today. What is end point for this ride: Bentonville, Wichita or Tulsa? Read below to find out. Wind and heat combined to make for a tough ride today. I thought I could escape both wind and heat, but at 5am the weather channel was reporting Russell, KS at 72 degrees with south winds of 16 mph. Oh well, still headed off southbound from Ellsworth in pre-dawn. There were rolling hills the first 16 miles. On the uphills this meant less wind and I could pedal into the wind on the downhills. I caused a stampede of cows as they viewed my strange contraption and then decided to run. This doesn't happen with cars, but with bikes the cows have long enough to get concerned. At 16 miles it became flatter and I could already see water tower for Lyons 12 miles distant. Still a steady headwind, but somewhat cool as I rode into Lyons. 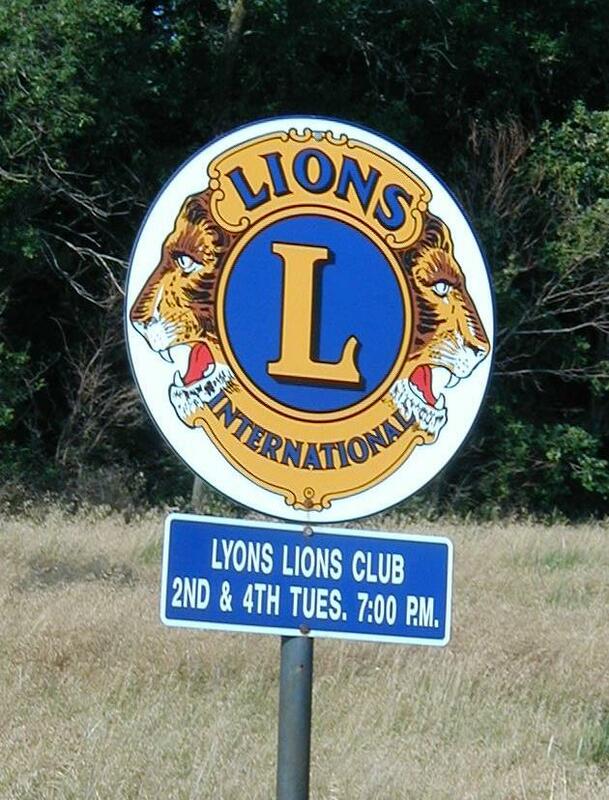 Lyons was midsized town with nice town park. Stopped at supermarket and also convenience store to rest and refuel. From here my route would take me eastbound for rest of the day. The wind was crosswind which was better though still heard it in my ears. Quickly outside Lyons into open farm areas. 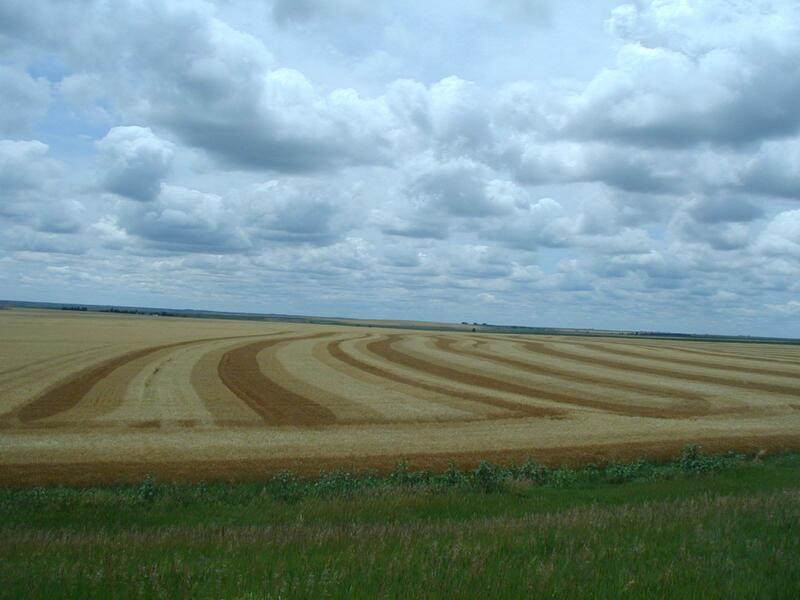 From newspapers, the wheat harvest is more than half done. Still see quite a few grain trucks and also occasional "wide load" as combines are moved. It was a steady ride with few hills towards McPherson. I could also feel it getting warmer, particularly after 11am. I went fairly quickly through downtown to the restaurant strip on other side at I-135. Here a chance to cool down and get lunch. On leaving, local thermometer said 94. It was hot. Despite the south breeze, I could definitely feel the heat. All total, I suspect I drank at least 3 gallons of water today...almost all gone via perspiration or respiration. In the afternoon heading east on US 56 I stopped in two or three convenience stores partially to get another cold drink and partially to let my body cool down. It was also a bit slow with wind and not very wide shoulders. In addition to grain trucks, a moderate amount of other truck traffic. As I was riding, decided while I could make it to Bentonville (~290 miles from Marion in three days)...it wouldn't be too pleasant if the south wind continued and the forecast heat continued as well...I also realized that my convenience store cooldowns might be tougher with 60+ mile afternoon gap between towns tomorrow and stores closed on the 4th of July. I passed small town of Hillsboro and then along Marion Reservoir. Local papers indicated an algae bloom had contaminated water recently for a month, but all better now. Here was a sign for Marion. Headed south and into center of quaint town. Saw a library with 15 minutes to closing. By now, I'd convinced myself that while I could make it to Bentonville...it might not be the most pleasant bike tour. 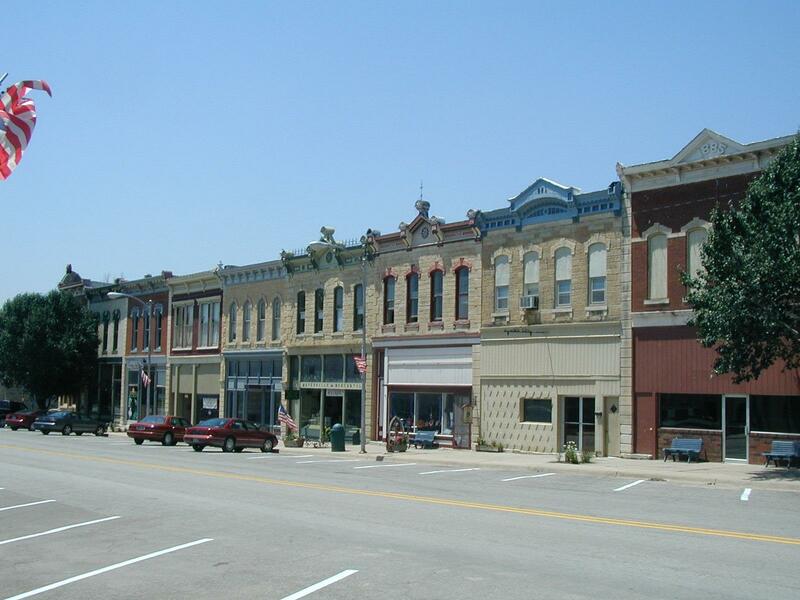 I'd rather stay in occasional quaint town like Marion than push into the wind for 12-13 hours. I quickly cancelled the Bentonville car rental and made a one way rental from Wichita to Tulsa. My revised plan is now as follows. 235 miles to Tulsa (mostly south) and 65 miles to Wichita. Tomorrow I'll start south to Florence and perhaps El Dorado. If still have some stronger south winds, then find a nice small town with 4th of July festivities and cycle into Wichita on Saturday. If weather cooperates than cycle further southbound. Will see. Found a nice motel and good restaurant. Otherwise relaxed at end of a warm and windy day. 95 miles today. Wichita it will be. Plan will be to rent car on Saturday and drive to Tulsa. Today less wind and warmer. I was on the road again prior to sunrise. Two miles to US77 and then south into light headwind to Florence. An interesting variety of vegetation. Unlike areas further northwest that are primarily wheat...this area also had grass pastures and corn fields. 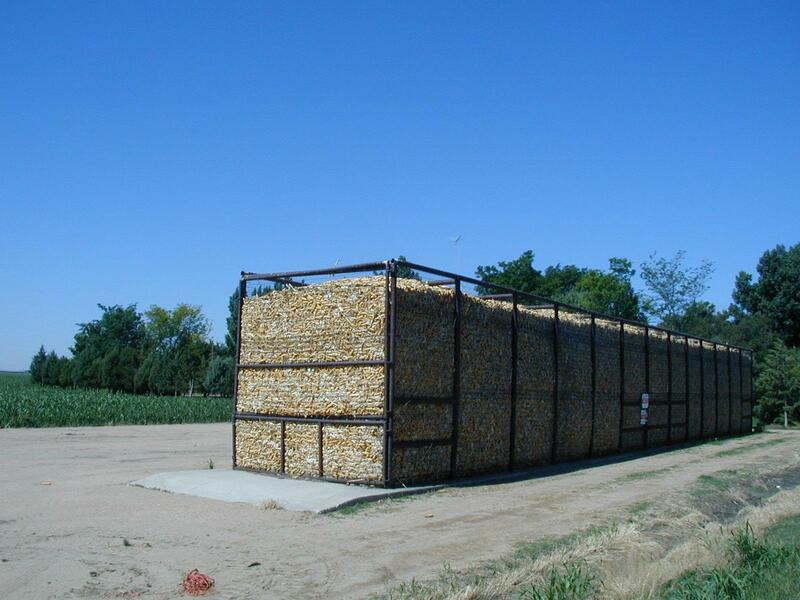 Corn was almost six feet high, in contrast to 2-3 ft further west in Kansas. Several trucks, ok shoulders and slight rolling hills brought me to Florence. I stopped at the park and considered options. There was headwind but not too bad, so decided to continue south. The first four miles with gentle grade to top of a hill. This was open country and the wind strengthened. Not much later, the road narrowed. At 21 miles the road bypassed small town of burns. Tall corn here and signs for a bakery. A Marion County sherriff stopped when I was looking at a map. 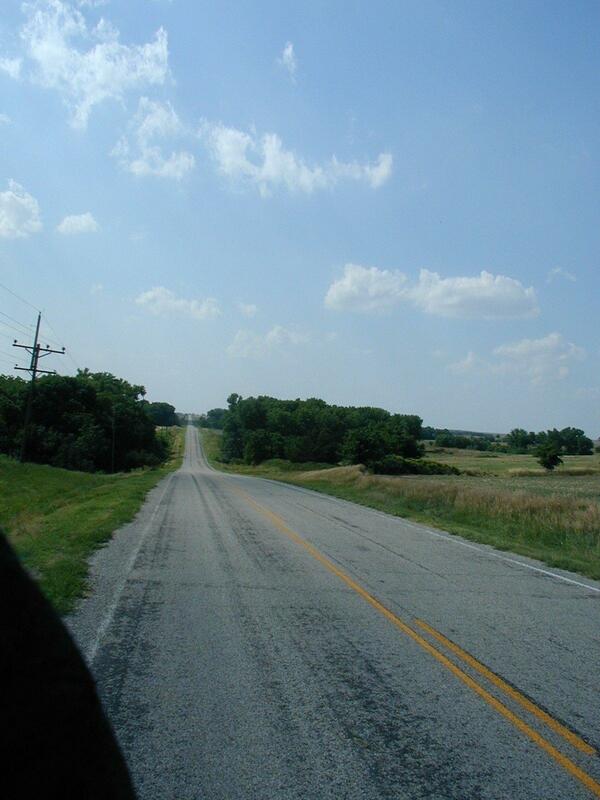 More open pasture lands, followed by some residential acreages as I came to the Kansas Turnpike at mile 37. I rode last few miles into El Dorado. It was already getting warm, and I decided to find place to stay. South through center of town and then west to the turnpike again. 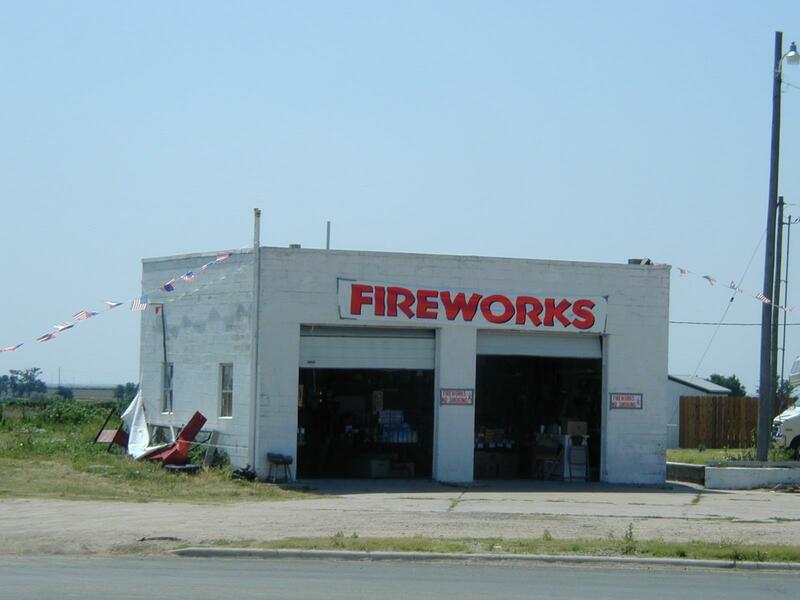 I've been looking for small town with parade and fireworks. Doesn't look like El Dorado will have much other than evening fireworks over their lake. 43 miles today. 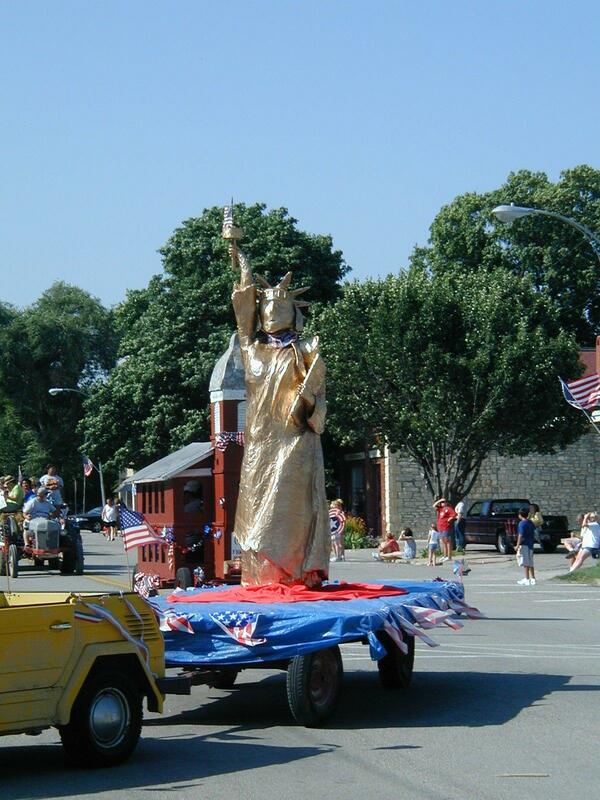 Today I went in search of small town Kansas to see the 4th of July celebration. 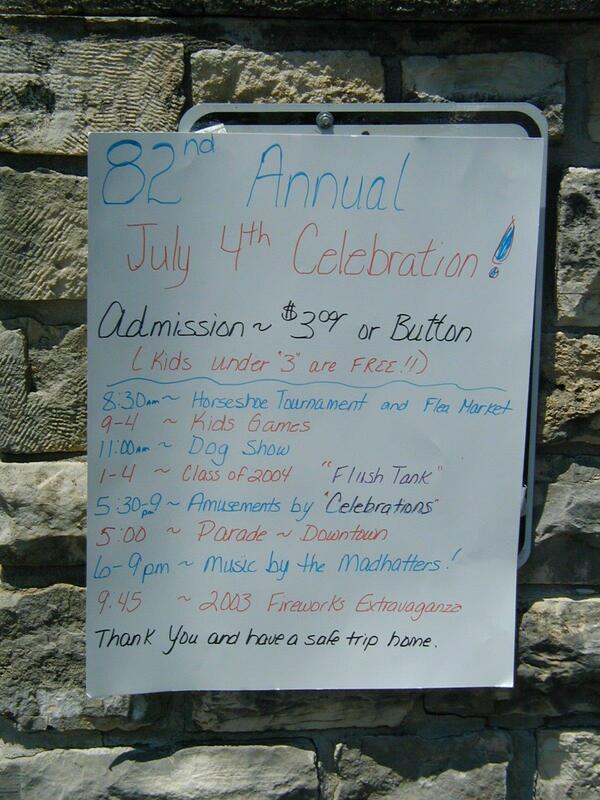 A place with this many small towns was bound to have a small town 4th of July. 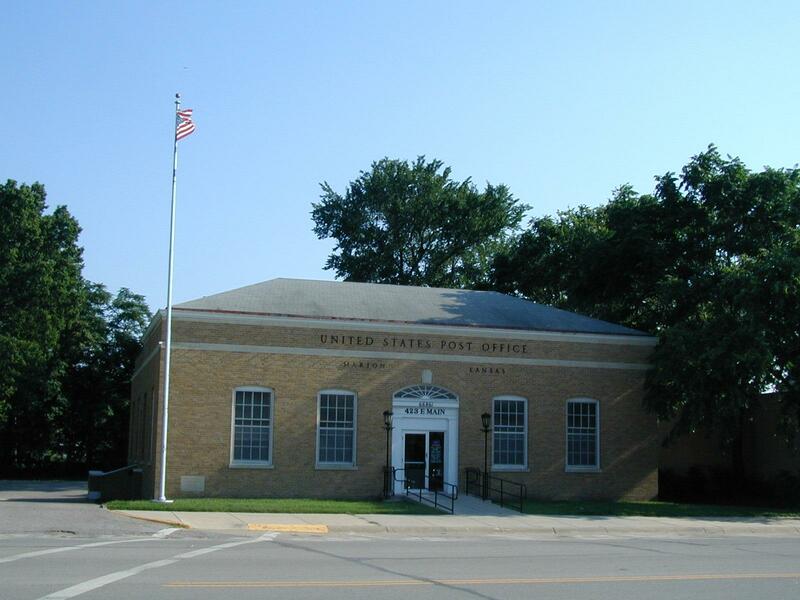 After asking locals, it seemed like Peabody, population 1387 was the best candidate. Only a little more than 30 miles away but I took off before sunrise to beat high temperatures expected in high 90s. Crossed over the turnpike and then on 196 northwest and downwind! My speed was twice what it had been on last two mornings. The road slowly curved around and past small town of Potwin (population 475 nothing for 4th of July but a cantelope festival in August). A few miles later local county road indicated signs to Peabody. 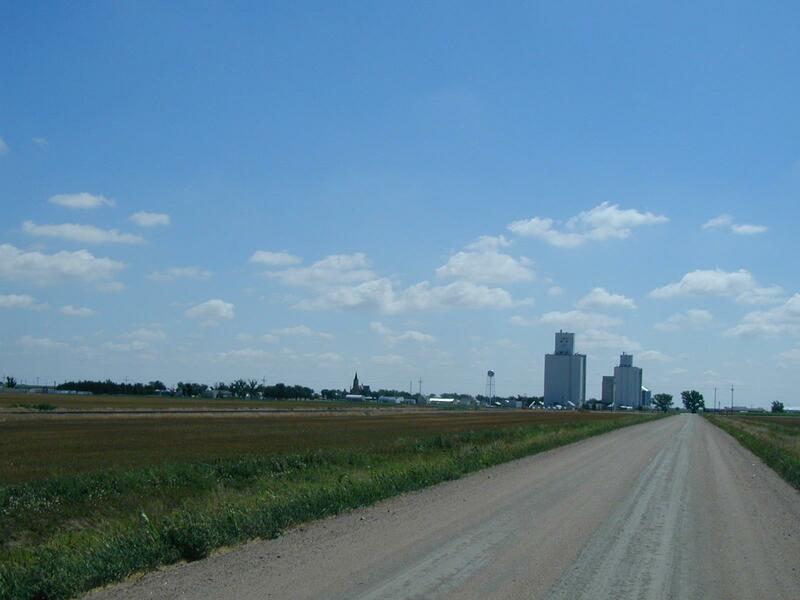 I continued through farmlands with tall corn, wheat and hay. In western Kansas the size of farms is much larger than here...thousands of acres instead of hundreds. 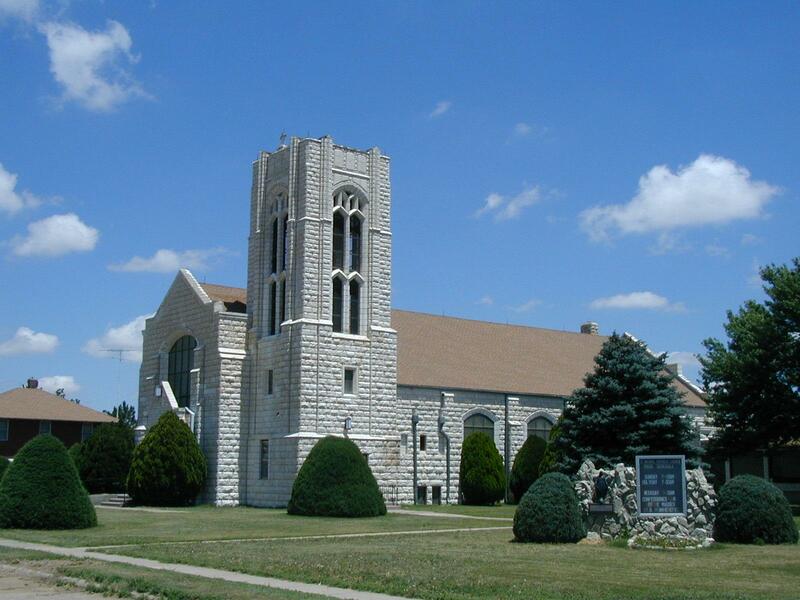 I've been seeing several mennonite churches and also occasionally women in headdress. A little past eight am, I came to Peabody with its grain silo and railroad crossing. I went through cute downtown and to US 50. I asked at fireworks tent for good place for breakfast. Answer was that there was only one place and I'd passed it back in town. Sharon's cafe was in old Kansas State Bank building downtown. This and other buildings date to 1880s and founding of the town. Nearby was the park with 4th of July activities. I watched the horseshoe tournament with 12 teams, walked past flea market stalls selling mostly junk and food vendors. A lazy morning and afternoon in the park as it was hot and humid but a breeze and shade trees helped. 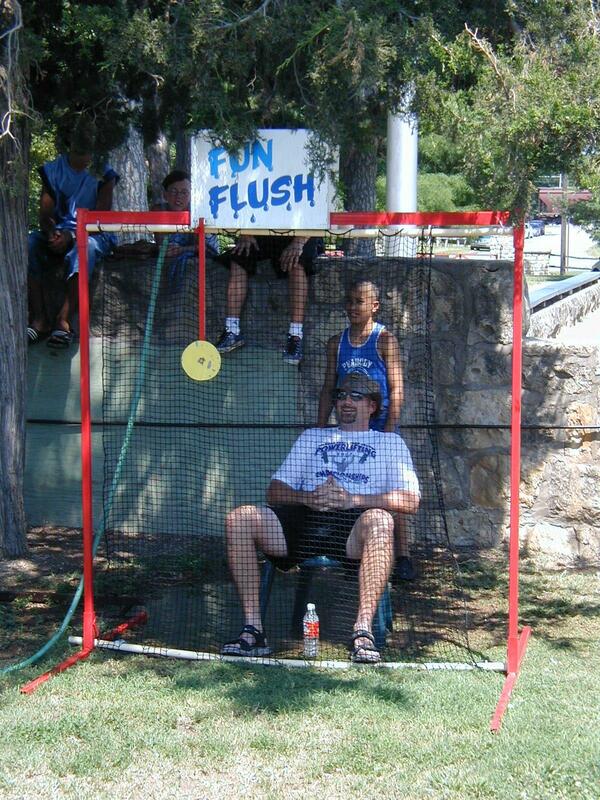 In addition to food vendors, local school had a dunk tank. I was surprised at how small the parade was without any bands or youth groups. Also surprising was almost no farm equipment, though understandable being in middle of the harvest. Within 25 minutes all was done. 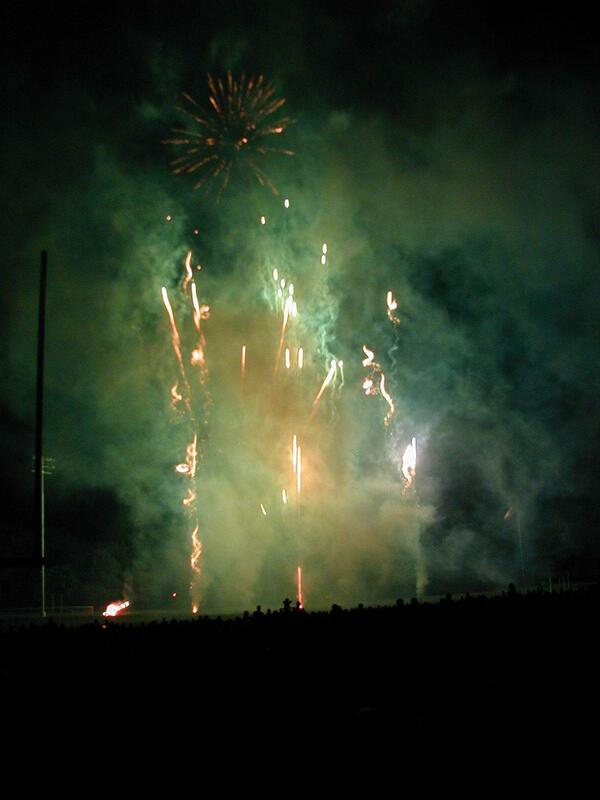 Peabody put on an excellent fireworks show last night. After the parade the park became steadily busier. 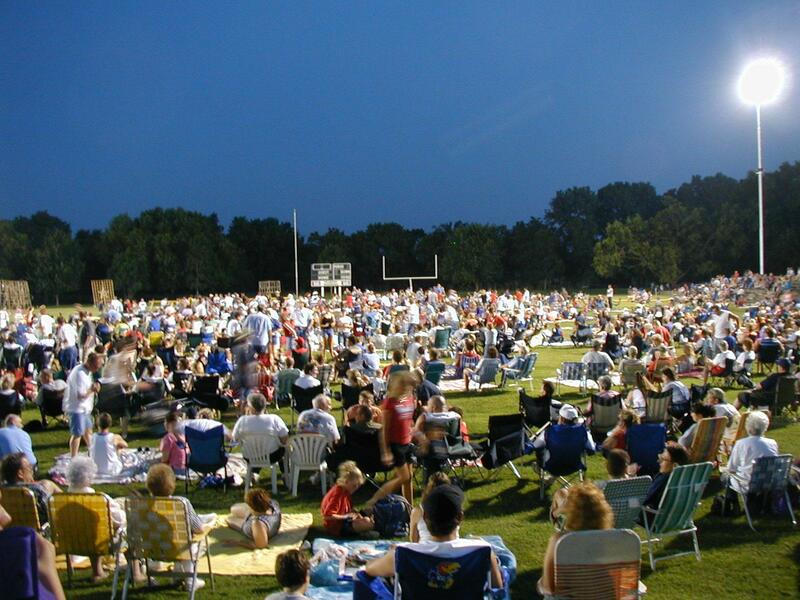 Music was being played on the football field and people placed lawn chairs and blankets down. About half an hour in advance, they made announcements including parade winners. Field lights were on but otherwise became dark. Announcers stated the crowd was 3000 to 4000 people (triple the town population). I was seated next to folks who brought their guide dog in training who unfortunately tried to hide during worst sound and fury. As 9:45 arrived, the national anthem and then the show started. The show was typically organized as triples: a ground display, background aerial fireworks and a theme song. I remember at least a dozen and a half ground displays including: three children themes (Nemo, Stitch, Spongebob), four sports themes (KC chiefs, Peabody warriors, Kansas wildcats and Kansas State Jayhawks), two religious themes (a cross and an angel), five patriotic themes (a flag, the liberty bell, statue of liberty, a blue star and outline of US with 227) four other themes (a windmill, waterfall, unknown face and a chicken). The finale was an 1812 theme with a ground cannon and a tremendous amount of aerials. Wow! I was impressed. 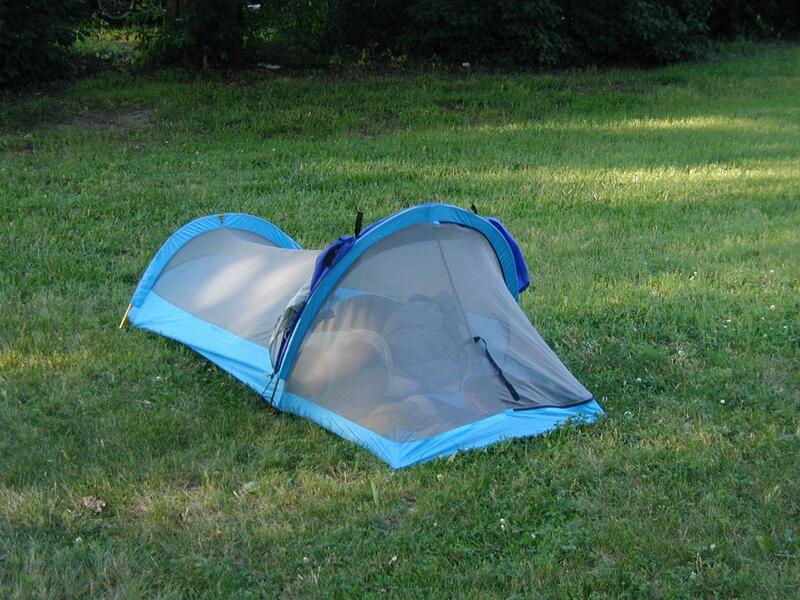 This morning I was up early, carefully packed my tent and set off. US 50 had these annoying rumble strips full length of the 8 ft shoulder but without too much fuss I was in outskirts of Newton at 15 miles. Here it took a few tries but eventually I found my way onto the old highway that paralleled 135. The old road was wide and smooth but came past several abandoned cafes and motels that must have gone when the new highway was built. It came into poorer parts of Wichita right downtown where I took a right turn onto Douglas and to the airport. "Oklahoma" was playing in the performing arts center. At Avis counter I picked up a rental car, packed up my bike and drove down to Tulsa to end the trip. Tomorrow I'll fly from airport here back to Denver. Overall, this has been a fun week. An interesting contrast between first five days with long days and the last three in the Wichita area. Given heat the past few days, I'm happy I made a shorter end than originally planned. Now time to plan the next segment starting in Wichita. 50 miles today.